Typhoon Doksuri appeared well-rounded and organized on satellite imagery as it moved through the north central South China Sea toward Vietnam. The Visible Infrared Imaging Radiometer Suite (VIIRS) instrument aboard NASA-NOAA's Suomi NPP satellite captured a visible light image of Typhoon Doksuri on Sept. 14, 2017 at 1:48 a.m. EDT (0548 UTC).Although Doksuri's eye was obscured by high clouds, the center was evident by the powerful thunderstorms that surrounded it. Doksuri's western quadrant had already spread over the east coast of Vietnam as it moved toward that country. On Sept. 14 at 11 a.m. EDT (1500 UTC), Doksuri, this year's 19th typhoon, had maximum sustained winds near 85 knots (97.8 mph/157.4 kph). The Joint Typhoon Warning Center expects slight strengthening through the day before a weakening trend begins on Sept. 15. Doksuri's center was located near 17.3 degrees north latitude and 109.3 degrees east longitude in the west-central part of the South China Sea. It's about 113 nautical miles (130 miles/209 km) northeast of Da Nang, Vietnam and about 240 nautical miles (276.5 miles/445 kilometers) from southeastern Sanya of south China's Hainan province. Doksuri was moving to the west-northwestward at 14 knots (16 mph/26 kph). The China Meteorological Administration (CMA) noted that a Gale forecast from Sept. 14 to 15 is in effect for the Guangdong, China coast, the Hainan Island coast, most of the South China Sea, the Qiongzhou Strait, and the Beibu Gulf. CMA said those in the warning areas "will be battered by scale 7~9 gale. Furthermore, the sea areas on the way of typhoon center are expected to be hit by scale 10~13 gale or scale 14~15 gust." Typhoon Doksuri was moving south of the coast of Hainan Island, China and is expected to make landfall south of the city of Vinh on the coast of Vietnam on September 15. 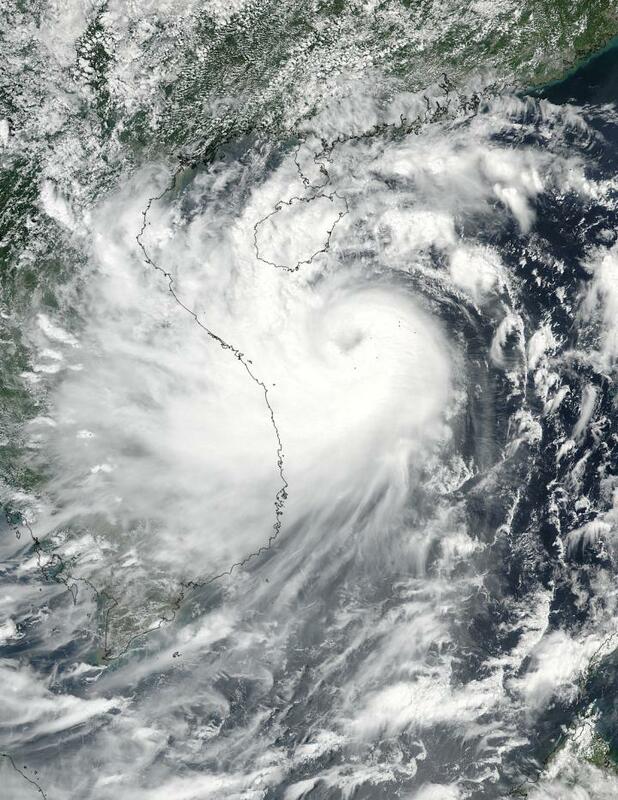 Vietnam's National Center for Hydro-Meteorological Forecasting (VNCHMF) has placed warnings in effect for Vietnam's coast. For updates from the China Meteorological Administration, visit: http://www.cma.gov.cn.